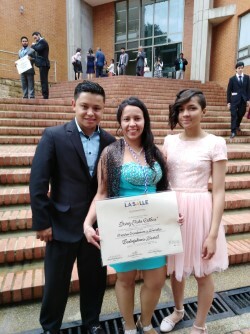 Fundación Social Fénix | Graduations ! Zarina received her diploma for a postgraduate specialization in Health Care Auditing from the Universidad Santo Tomas. Zarina with Fénix co-founder Beatriz - and her postgrad diploma. Disney graduated in Social Work from the Universidad de La Salle. And Viviana, a doctor, graduates shortly with a Masters in Public Health from the Universidad Los Andes. Thanks to Doug, Kate, Richard and all the other generous Fénix supporters, a core group of highly skilled and motivated care professionals is taking positions where they can make a difference. Disney is already working with a foundation for high-risk street people, Viviana is directing a programme in a major health care company, Yenifer is quality auditor for an important Bogotá hospital, Zarina is looking for a post where she can direct dentistry programmes for children, Angélica is working with the children of violence affected families in a rough Bogotá suburb. Kyliam later this year will complete her postgraduate specialization in Epidemiology and is leading health care programmes for her Ticuna people in Amazonas. Now they hope to be able as a team to bid for contracts to design and provide health care promotion, education and access for vulnerable and excluded youth.